The bowie knife's origins date back to the early 1800s, smack dab in the middle of Texas with Colonel James "Jim" Bowie, the designer of the well known blade style. After a renowned winning fight with the notorious Norris Wright, every townsman wanted a blade just like Bowie's. Bowie took his design to local smith James Black, who designed the blade with the standard false edge on the top, after popular European trends of the day. So with all that said, looks as if the styling and functionality of the original Bowie blade made its way onto this particular Wrangler knife. It should prove useful in many different activities for you, as well as being a great showpiece with a fascinating history behind it. The handle is crafted from attractive, sturdy maple wood. 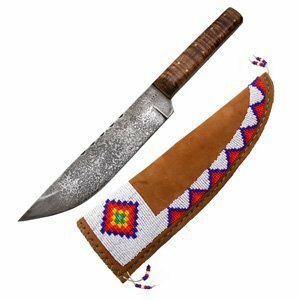 Comes with a hand-embroidered leather sheath, each one uniquely handmade in North America.